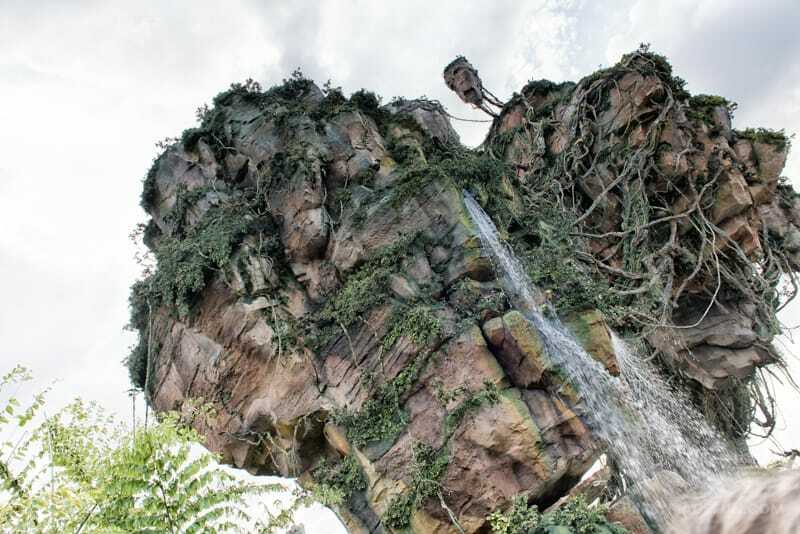 Its always exciting when there are new rides at the parks, and Disney’s Pandora does not disappoint! 2- this is one land I won’t get excited over. Ohhh boy was I wrong. I think Disney’s Pandora has changed me y’all. I actually want to go home and watch Avatar again. And I was perfectly fine seeing it the one time and then never going near it again. But when you actually see what Disney has done with the land it’ll make you swoon and have all the heart eyes for everything they did. Because it’s pretty amazing. Though I still don’t understand how the new land fits in with the animal theme at the kingdom. So if someone could explain that to me I’d be forever grateful. 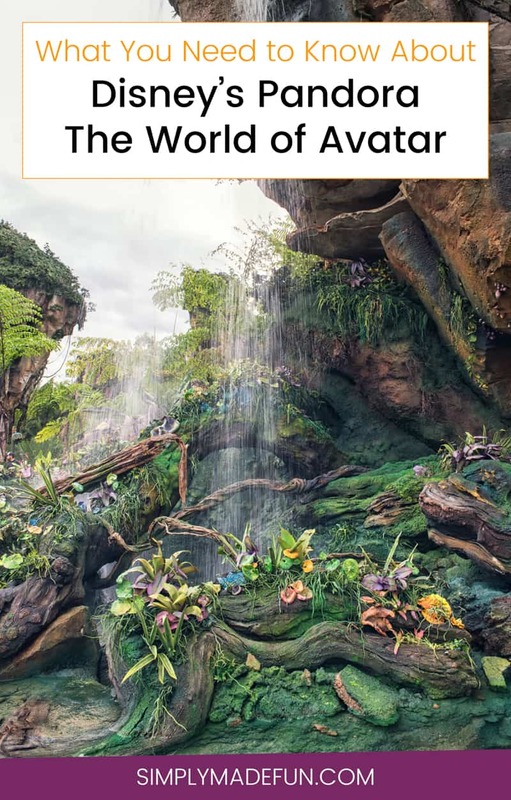 The World of Avatar is Disney imagineering at it’s best. Even the rides are spectacular and you can really see how the quality of the decor has advanced over the last decade. Disney always has a way of making me fall in love with things over and over again, and they turned a skeptic and cynic (in terms of the Avatar movie) into a full-on lover and believer. And I think you’ll be just as obsessed with the new land as I am! Here’s everything you need to know about Disney’s Pandora! I’ll admit that I really didn’t have a lot of expectations with the rides in Pandora. I hadn’t done any research beforehand other than looking at the My Disney Experience app to see if we could grab Fastpasses for them a few weeks before our trip (ps- I couldn’t). And once we got to Pandora it was pandemonium as everyone was high-tailin’ it to the ride lines. Chris and I were not about to wait upwards of 120 minutes for either ride, so we decided to look around and come back for the Extra Magic Hours that lasted until 1:00am. PRO TIP: Animal Kingdom is having extra EMH to accommodate for the crazy Pandora crowds from 11pm to 1am through July 4th. Na’vi River Journey – We waited 15 minutes when we got there at 12:30am on Tuesday Night and honestly, that’s about all I’m willing to wait for that ride. It actually is a replica of It’s a Small World where you just float along and look at all the sights (without the song getting stuck in your head!). Don’t get me wrong, the ride is gorgeous but Chris and I both got off and felt like something was lacking. We later realized (after talking to a Cast Member) that there was no story for the ride and that’s what had bothered us the most. The sights and sounds were wonderful and it was nice to get off of our feet for a few minutes, but it is a very short ride that is definitely lacking in the storytelling department. Verdict: It’s a great family ride for all ages since there are no drops and it is a smooth ride all the way through. But it is a very short journey and I wouldn’t wait more than 20/30 minutes for the ride. Flight of Passage – We waited for 40 minutes at 12:50am on Tuesday Night and would do it all over again. The first part of the queue is outside and you get some amazing views of Pandora as you’re walking up. They also have a lab that you walk through and it was pretty cool to see all the detail the Imagineers put into everything. The only downside is this; once you get through the incredibly long line (it’s made to accommodate a lot of people!) you still have three different holding rooms they put you in before you get on the ride. So it definitely takes a while to get to the actual ride part. Once you’re in the room for the ride they’ll have you put all of your belongings in a little cubbie behind you and get on your bike. The seat will lock you in for your flight so even though you’re “flying” on your journey you are safely strapped in and won’t be going anywhere! This ride is our new favorite in all of Disney, it’s amazing! I will say that there are a few things that jump out at you on your flight but it’s not too terrible. You also feel like you’re free-falling a lot, which is a very weird but very cool experience. It’s basically Soarin’ on steroids. Verdict: This ride is a MUST-DO. If you cannot get a Fastpass for it it is definitely worth a 75-90 minute wait! But, if you don’t like big drops on roller coasters (or the Tower or Terror) you probably won’t like this ride. There are plenty of “drops” and since it’s a 4D ride there will be things that jump out at you. Also, the 4D glasses are a bit big so if you have a smaller head then they do slide around (I definitely had that problem!) so younger kids may have that issue as well. PRO TIP: Make sure you squeeze your legs into the side of your bike when on the ride. You’ll be able to feel your banshee breathe! Also, once on the bike (and before the ride begins) look around you, you may be surprised by what you see! After talking to a few Cast Members I was so excited to try the food in Pandora. At the Satu’li Canteen they basically have protein bowls where you can choose your base, protein, and sauce and I was super excited. Especially because they offer quinoa and that’s my jam. So delicious. That’s where my excitement ended though. I ordered a quinoa and kale bowl with chicken and the creamy herb dressing, and it was good but I was so disappointed that there was barely any quinoa in it! I also ordered my toddler a bowl of chicken with rice and was told that all the rice has tree nuts and coconut in it (and we have a peanut/tree nut and dairy allergy in our house) so that was a no-go. Also, the chicken is NOT toddler approved, and my toddler eats anything. I don’t think he was a fan of the spices that were on it. But Chris and I both thought the chicken was pretty good. Pongu Pongu offers drinks and a specialty snack, but we only tried the Night Blossom. It was sweet and colorful and I’d definitely get it again! The pear was my favorite part, it gave the drink a really unique flavor. I can’t wait to go back and try more of what they have to offer on our next visit! YOU GUYS. The views in Pandora are amazing. I could’ve walked around for hours just taking pictures and admiring all the work of the Imagineers. They really outdid themselves with this land and it makes me super excited for all the stuff to come to the other parks in the next few years. While the daytime views are gorgeous they have nothing on the nighttime views. The bioluminescent forest is incredible at night and I wanted to stand there for hours taking pictures of everything. Everything glows. EVERYTHING. And of course, there are blacklights all over the area so the guests glow as well. It’s SO COOL. If you were there on Tuesday night (May 30th) at 1:30am you probably saw a crazed lady running around with her tripod trying to get pictures….that was me. NO SHAME y’all. No shame. GO. You need to go! Pandora is amazing and you will love every second of it. Well, maybe not the long lines but there’s a lot of other cool stuff that you WILL love. And once you’ve experienced it please come back and let’s geek out about it together. Because I am fan-girling over this new area HARD. 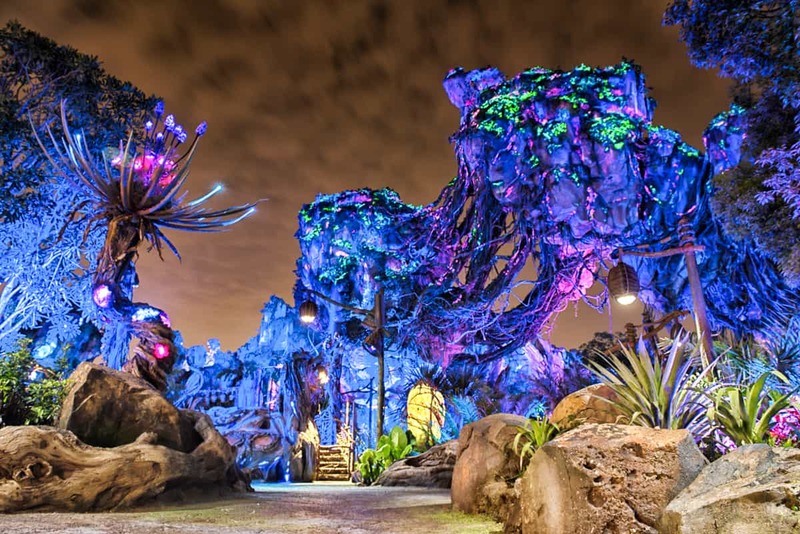 Are you planning to visit Disney’s Pandora any time soon? If you’ve already gone, what was your favorite part? I had no idea that this happened at Disney. I will have to check it out! Love Disney! It is amazing! I hope you get to check it out soon. I always thought that unless you went to Animal Kingdom often you’d never know it was there. If you turn left at the Tree of Life and then another left before the Pizzafari you’ll walk right into it. But it’s away from the beaten path so unless you’re really looking for it you wouldn’t see it!